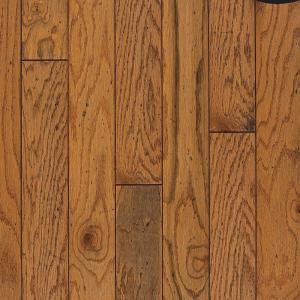 The Bruce Clifton Rustic Oak Honey 3/8 in. Thick x 5 in. Wide x Random Length Engineered Hardwood Flooring features 5-ply engineered red oak wood construction in a honey color, and has been stained and distressed for a rustic look that can complement almost any home design. The flooring planks feature a Janka hardness rating of 1290, signifying high resistance to denting for long-lasting use. Appropriate for installation on or above grade, this flooring can be installed using either floating, glue- or staple-down methods. 25 sq. ft. per case. Case weight is 42 lb.